A fresh, light, summer salad that comes on a pizza? Come on down. 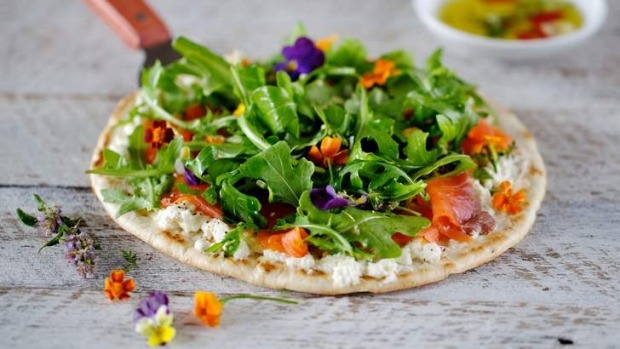 Pick up a pack of pizza bases - or whip up your own - and top them with ricotta, smoked salmon and peppery rocket leaves. Scatter with edible flowers or herbs, and home-deliver. 1. Combine the ingredients for the chilli and garlic oil and set aside. 2. Heat each pizza base in a hot, dry pan or on the barbecue until lightly tanned. Set aside to cool for five minutes, or it will be too hot for the topping. Spread the ricotta or cream cheese on each base, scatter with black pepper and arrange smoked salmon on top. Toss the rocket leaves in olive oil, lemon juice, sea salt and pepper and strew on top. Scatter with edible flowers and serve with the chilli and garlic oil for spooning over the top.